Last night, mom and pop M (i.e., the in-laws-to-be) wanted to treat the ervy and me to a nice dinner in Seattle. It was the first time they'd seen us since we have gotten engaged (that totally slipped my mind, otherwise I would have cleaned the ring a bit...) so it was a celebratory affair. 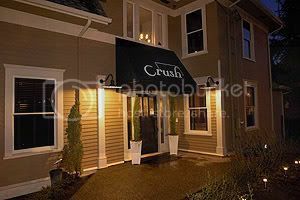 We ended up going to the much hyped and super trendy Seattle restaurant Crush. The atmosphere reminded me a bit of Bay Wolf in Oakland in that the restaurant had taken over a house in the middle of the city. I should mention that the clientele did seem to be very pretty people better dressed (or just more dressed up) than I would normally expect. 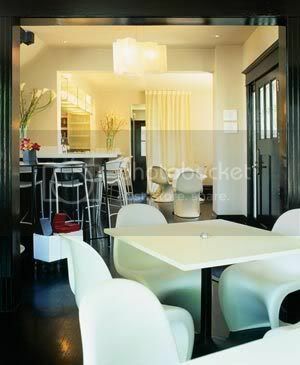 The decor was very trendy, very modern and architectural. All the glasses were Reidel (my first time drinking out of a Reidel water glass... it was nice, but admittedly, I was really worried about dropping it for some reason. I guess I'm too used to those clunky, thick water cups you get everywhere else). The plateware was all really neat. It was typical white, but everything was a bit off-balance, nothing symmetrical. Mom M's soup bowl leaned such that it presented her with a really neat thin layer of Red Kuri Squash soup facing and leaning toward her. Wow, it's amazing what google images is good for! This is actually the very table we sat at... the lighting is alot dimmer at night or while serving though. It was too dark for me to take my own pictures with my camera phone. On FOOD: I had a wonderful fresh (and local) chicory greens salad with roasted pumpkin pieces (which were so scrumptious!). Evan had some yummy sweatbreads which I actually thoroughly enjoyed (they tasted very chinese reminiscent, although I don't think they cooked it in a chinese style). Pop M had a neat looking dungeonous (sp?) crab cake thing. I have to say, I think my main course rocked the hizzy. I had Alaskan Black cod with pork belly and spinach in a syrah sauce.... OMG... The fish was perfect and delicious. The whole thing was so rich and perfect that I really really REALLY wanted to lick my plate clean. It was absolutely one of the best fish dishes I've had ever. The one thing I was disappointed in at Crush were the desserts. They were very inventive, but they didn't come together well. Erv had an apple tart with Amish blue cheese ice cream and a bacon cookie. 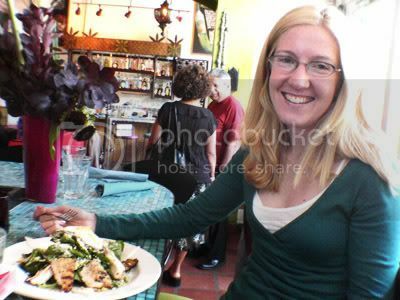 (I tried this, and really, I felt like I should be eating a cobb salad... it was interesting, but didn't belong on the dessert menu... they should have had it as an appetizer!). Mom M had a molten chocolate cake thing with local huckleberries... I was actually surprised that I didn't like this. I normally love molten chocolate cakes, and I didn't expect to dislike this one as much as I did. It was overpowered by the huckleberries and fruity sauce. My dessert was the Warm Gingerbread cake with Chevre Ice Cream and figs in a pomegranite sauce. It just didn't really go together. I liked the Chevre ice cream. But I didn't really enjoy the cake or the fruit (much to my surprise). If you go to Crush, which you should, have delicious appetizers, dinner, and wine (we had two bottles of Syrah, the $80 bottle was actually distinctly a lot better than the $40 bottle, I probably could have skipped the cheaper one without regret. I didn't pick out the wine, so I actually can't remember the names... too much cognitive load while trying to keep up greatadequate conversation with mom and pop). Skip the dessert. Here's Clara and me at the office. You can see one of my big Ikea flower stickers on the wall. They REALLY help brighten up the windowless office fare. Again I don't have too much time (why do I never have time anymore?) 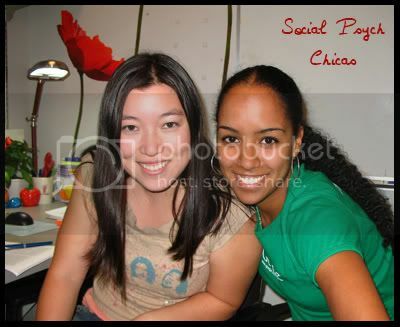 I wanted to post these cell phone pics of my friend Nicole and me from the end of the summer. 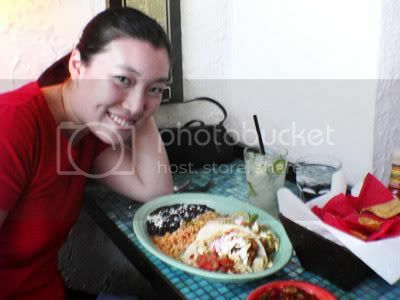 We had lunch at Cactus in Seattle. It was soooo yummy! It was southwest type food.